Janella’s Chemical Free Week: BPA (Bi Phenol A). 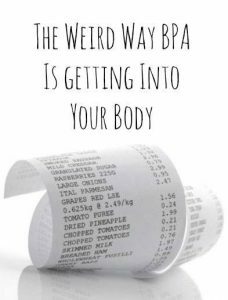 BPA is an industrial chemical that has been used to make certain plastics and resins since the 1960s. This carcinogen is linked to infertility, developmental delays and diabetes. BPA is used in the lining of canned food and other food packaging like coffee tins and plastic containers. You may not realise this but it’s also used in making cash register receipts. My Gawd! Suggestion- Use BPA-free products. Manufacturers are creating more and more BPA-free products. Look for products labeled as BPA-free.